Plot – Federal Agent Matt Graver (Brolin) once more enlists the services of feared hitman Alejandro (Del Toro) to help him start a civil war between Mexican drug cartels after an horrific act of terrorism linked to the cartels is acted out on American soil. 2015’s Sicario seemingly came out of nowhere. Heralding in another impressive effort from its growing in stature director Denis Villeneuve, marking the feature debut of writer Taylor Sheridan and wowing critics the world over with its starkly beautiful and tension riddled examination of shady government activities and Mexican drug cartels, Sicario was a twisty turny thriller of the highest order. 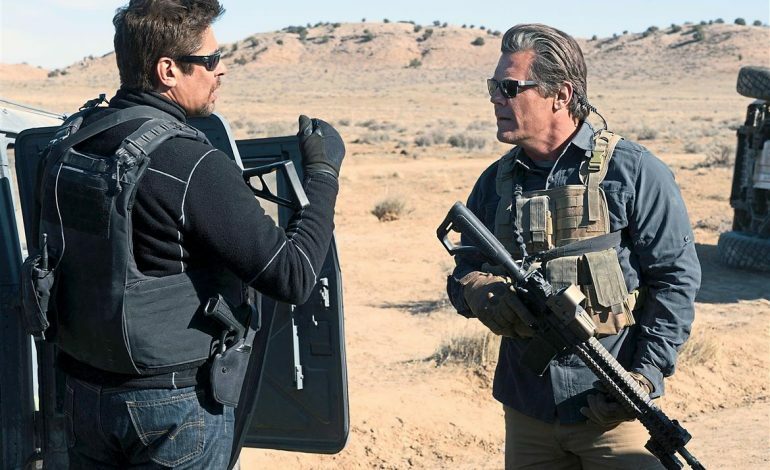 A problem with Sicario’s unexpected successes and receptions is that now for its sequel, Day of the Soldado, the stakes have been raised and expectations in turn higher. It’s expectations that Soldado can’t quite meet, far from terrible it may be, the film can never get to where the now series found itself with Villeneuve, Emily Blunt and DOP Roger Deakins on board in the first incarnation. Things start off well and all looks set to be a welcome return to the gritty world created by Sheridan and new director Stefano Sollima, yet while the same slowly paced tone and unrelentingly grim outlook remains in place, Soldado’s emotionally lacking and curiously directed narrative created by Sheridan never hook us the way in wish we would’ve liked. Sollima’s film feels like a collection of sporadically great scenes and scattered gems from Sheridan rather than a highly cohesive whole and by the films last act there’s an inescapable feeling that Soldado doesn’t quite justify its existence outside of laying a foundation for another go-around for the series. In amongst all of this is a collection of solid enough acting turns with the first films MVP Benicio Del Toro once more stealing the show as efficient government hitman and all round trouble maker Alejandro. A mysterious and intriguing player in the 2015 outing, we get a much better look at Alejandro this time around, as he is once more recruited by Josh Brolin’s gruff Federal Agent Matt Graver, this time to do a bout of cartel kidnapping to insight some over the border carnage, and Del Toro is up to the task. Both chillingly efficient and curiously human in his plight and actions, Alejandro is the heart and soul of Sollima and Sheridan’s tale and when his in sight of the screen, Soldado’s proficiently produced proceedings make for highly engaging viewing. It was always going to be a tough task for Day of the Soldado to better its highly impressive predecessor, yet while it fails to reach those heights, there’s enough here to suggest that this wannabe franchise still has legs moving forward, even if Sollima’s newest entry is more middle of the road than it should’ve been. I think it’ll be better looking back on it someday when we can watch 2 and 3 back to back. Yeh I wonder if there will be a third with everyone back again? I get the feeling it would be not worth the time if Brolin and Del Toro don’t come back. That’s the plan according to Taylor Sheridan. That’s why this one ended the way it did. Have you watched any of the show Yellowstone? I am keen to hear how people feel about Sheridan’s work on that. No. I actually forgot about that. Need to add that to the list. By the way, you ever see Suburra? No mate, must admit I’ve not heard of that one! Italian crime film from this same director. Do yourself a favor and check it out, it’s amazing. Thanks for the heads up man, I really liked his work on Gomorrah so I am keen to check that out. That’s on my list too, if I can only find the time! It’s a fair epic that one and very slow moving but its worth the watch when you get the chuck of time. Oh yeh man its a lot better than most thrillers, still well worth a look! You seemed to like this a little more than I did. I didn’t hate it, far from it, but even ignoring the original, this felt like a simple action film, not thrilling or tense at all, at least for me. My biggest problem was how insanely predictable it was. Yeh man it wasn’t close to the original despite having some pretty awesome singular moments. I think one thing I didn’t like was just how insanely slow the whole thing was paced out at for no real reason. I guess we’ll see all that in the third movie. Ugh, another franchise and another horrid ending! Be interesting to see if they all come back for another round mate. I hope they can finish it all off with a bang if they do. It’d be great if they do… but the tension and set-pieces of the first make it not seem like a franchise at all. The first felt like a completely different film about the same subject, even with characters carried over. Spot on man, it was still a better thriller than most, just slightly disappointing when weighed up to the first.